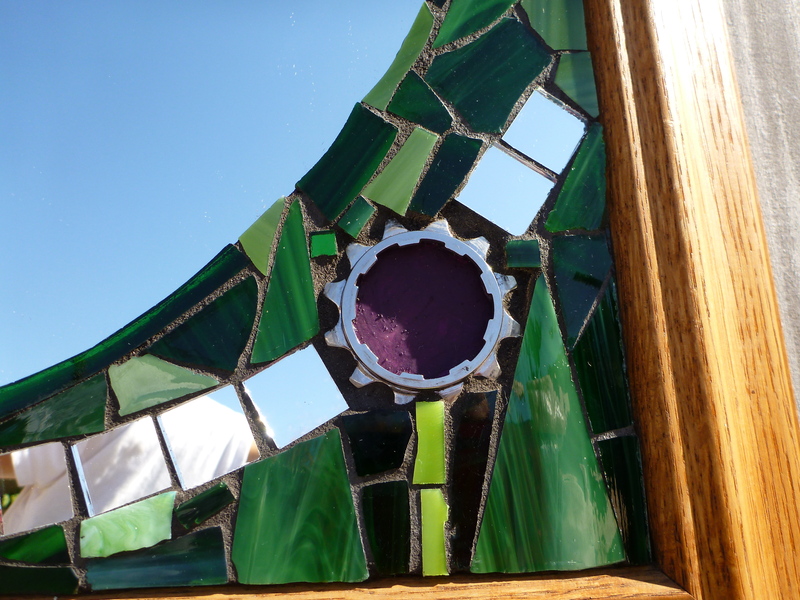 A very good friend commissioned me to take her old oak framed mirror and mosaic over some of the glass. 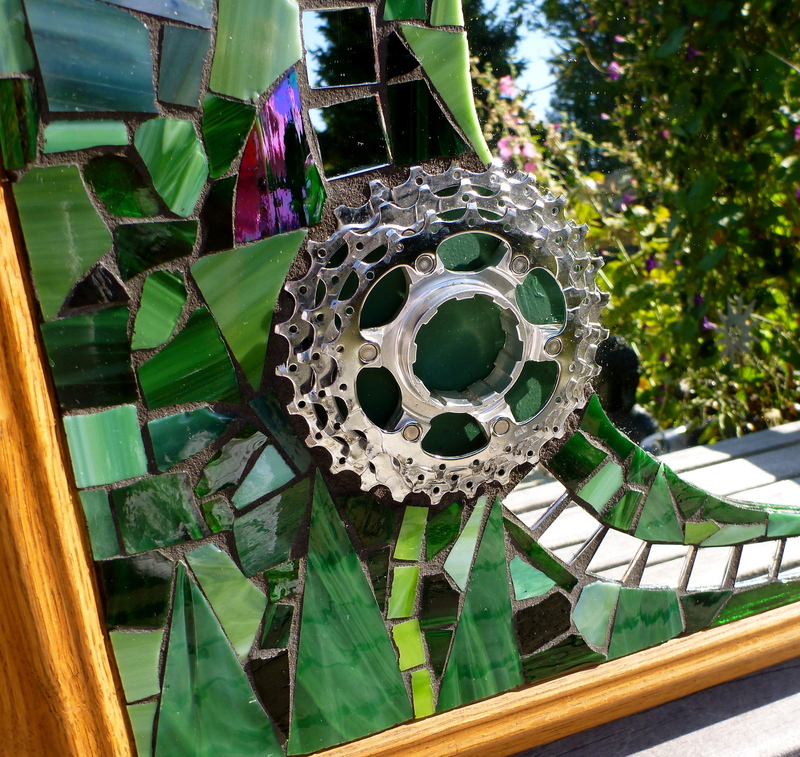 The mirror handed down from her mother was outdated with etched ’70s style bright orange and green painted flowers and leaves around the white frosted glass borders. It was a perfectly good mirror and frame but the style and flowers didn’t suit her taste. She gave me artistic freedom to do whatever I wanted and knowing the mirror had some sentimental value, I took the job seriously. After staring at it for a few weeks not coming up with any ideas, a lightbulb went off in my head. I was thrilled to finally overcome my artist’s block. I ended up using my friend’s passion for inspiration, thus the work could finally begin. 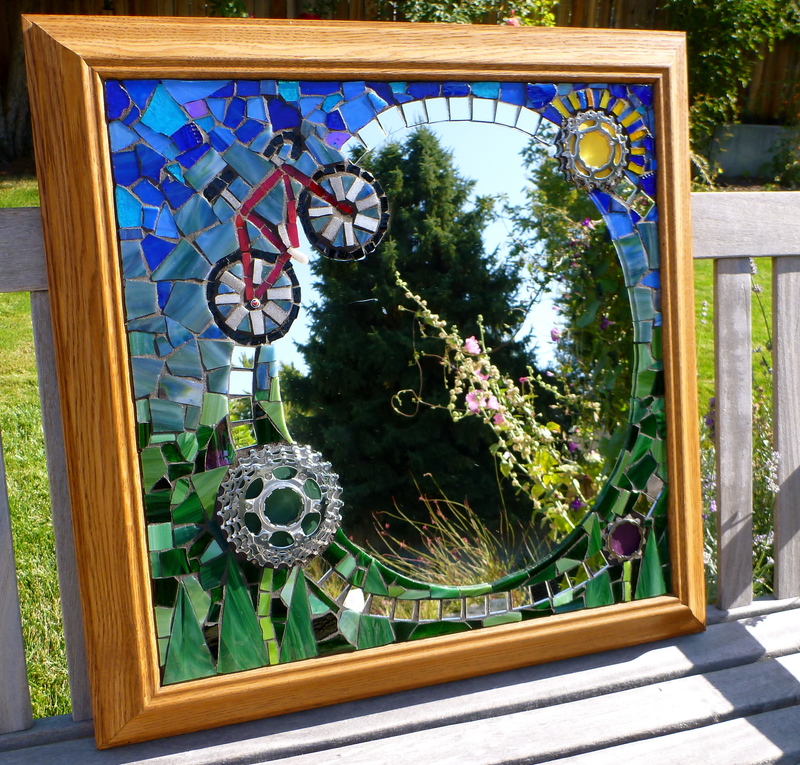 Recycled glass and re-purposed objects glued to the mirror. Look familiar? 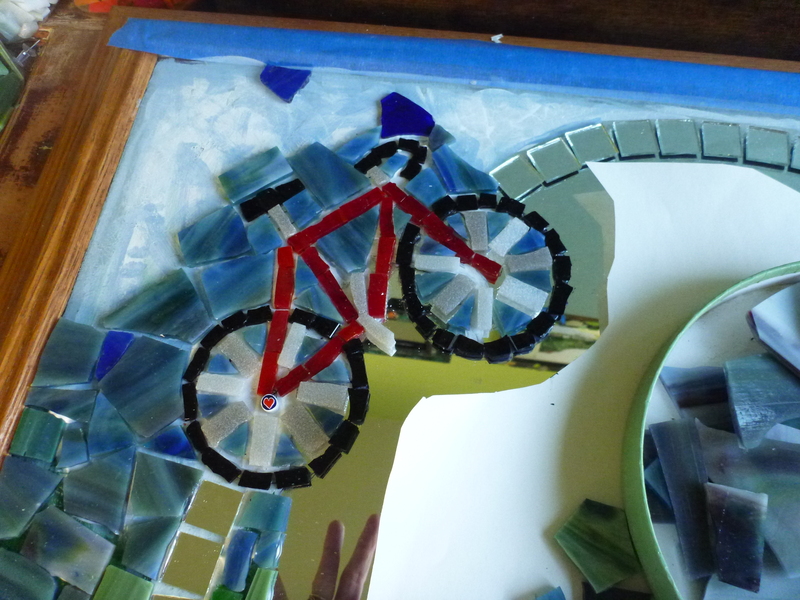 Red bicyclette. Not exactly their lovely merlot-colored carbon fiber Calfee tandem, but will have to do. Climbing the hill! My favorite rides with Sharon have been riding up to Idaho’s Bogus Basin and Wyoming’s Grand Targhee ski resorts. 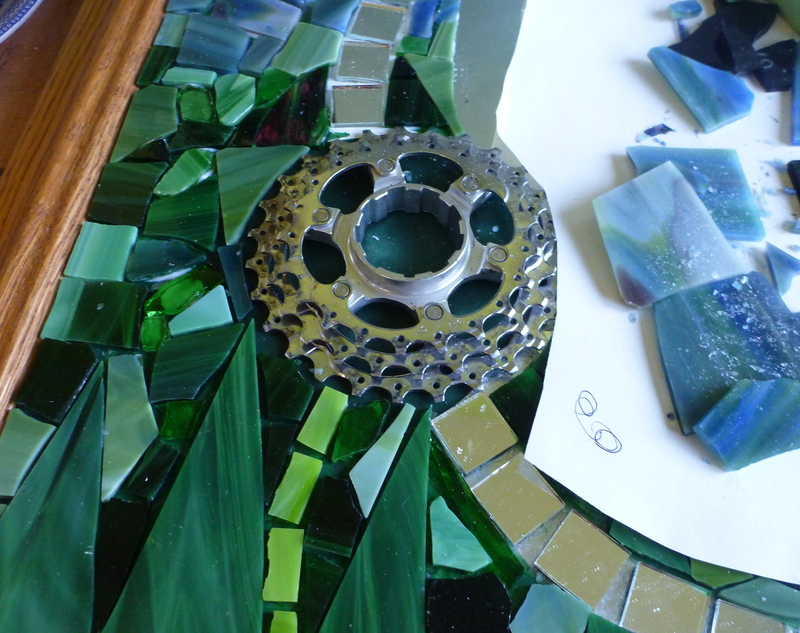 I always get attached to my mosaic commissions in the end since a lot of thought and work go into each piece and usually they are hard to part with. I hope Sharon will like and treasure her updated mirror. 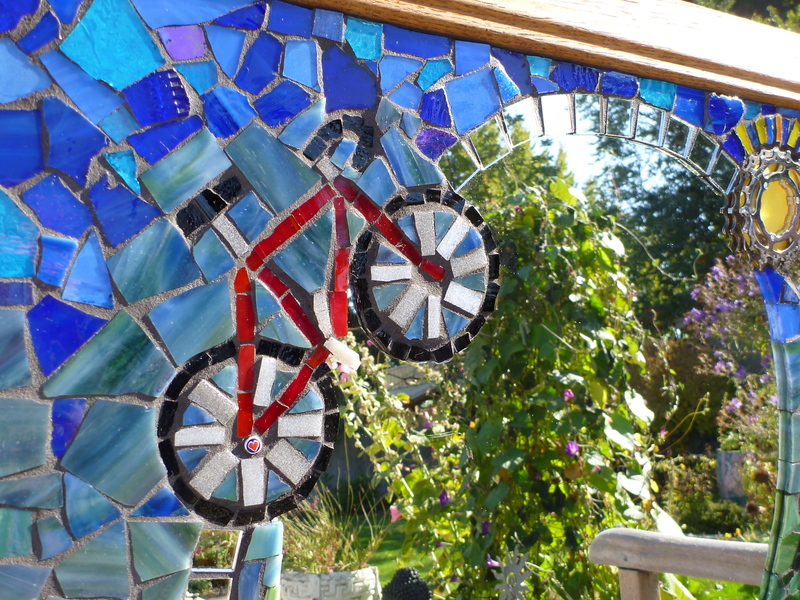 If alive, I’m sure that her mother would have approved of her passion for cycling and the new mirror as well. Wow, it is beautiful and such a great story! I’m now on a mission to find a mirror that you can re-purpose. Can’t wait to see where Sharon puts this masterpiece.